Blog / Palace Station picket: *Cancelled* Tomorrow at 11am! 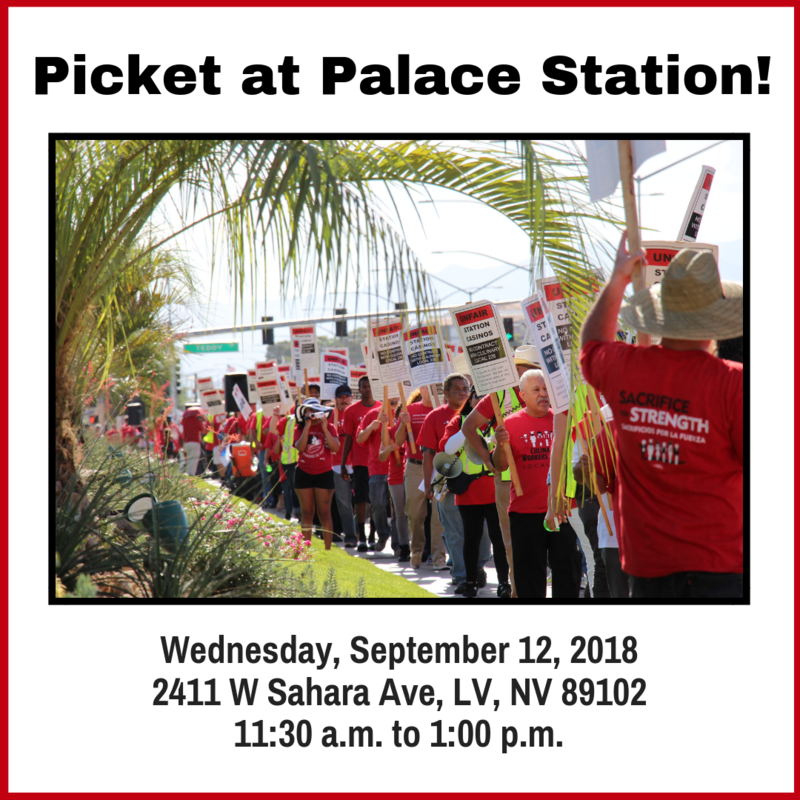 Palace Station picket: *Cancelled* Tomorrow at 11am! As Station Casinos invests $192 million in renovations at Palace Station, approximately 75 workers are slated to be affected by layoffs and termination at Palace Station’s Grand Café. Some workers have already bid into other jobs at the property, but many bartenders and workers remain under threat of termination as the venue closes for a 4-month renovation. The Culinary Union is fighting to ensure all workers are retained and offered extended recall rights when new venues at the casino hotel reopen. Join your union brothers and sisters as we picket in front of Palace Station! SAVE THE DATE: September 27, 2018: Culinary Union members will march downtown in solidarity with workers at the The D, Golden Gate, Margaritaville, and Treasure Island. Workers at these properties have been working without a union contract since June 1, 2018. Mientras Station Casinos invierte $192 millones de dólares para hacer renovaciones en Palace Station, está previsto que aproximadamente 75 trabajadores serán descansados y despedidos del Grand Café en Palace Station. Algunos trabajadores ya han firmado bids para pasarse a otros puestos dentro de la propiedad, pero muchos cantineros y trabajadores siguen bajo la amenaza de un despido cuando se cierre el local durante su renovación de 4 meses. La Unión Culinaria está luchando para asegurarse de que mantengan a todos los trabajadores y les ofrezcan una extensión en sus derechos de reincorporación cuando abran los nuevos locales en el casino-hotel. ¡Acompañé a sus hermanos y hermanas mientras hacemos una línea de protesta frente a Palace Station! Los miembros de la Unión Culinaria marcharán por el Downtown en solidaridad con los trabajadores de The D, Golden Gate, Margaritaville, y Treasure Island. Los empleados de esos casinos han estado trabajando sin contrato sindical desde el 1º de junio del 2018.